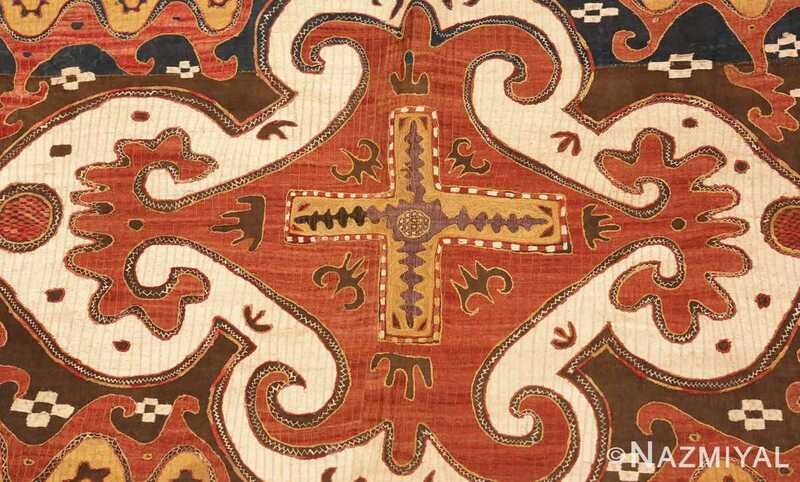 Extremely Rare and Collectible Antique Kaitag Embroidery, Country of Origin / Textile Type: Daghestan, Circa Date: Early 18th Century – This early 18th century Kaitag embroidery is extraordinarily well preserved. 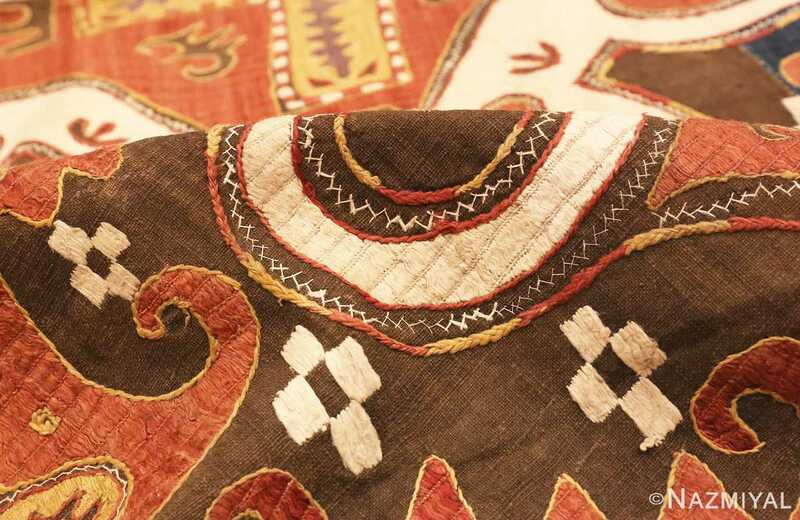 Its earthy color tones and traditional design symbols give this beautiful antique embroidery a simplistic, tribal, primitive and natural feel. 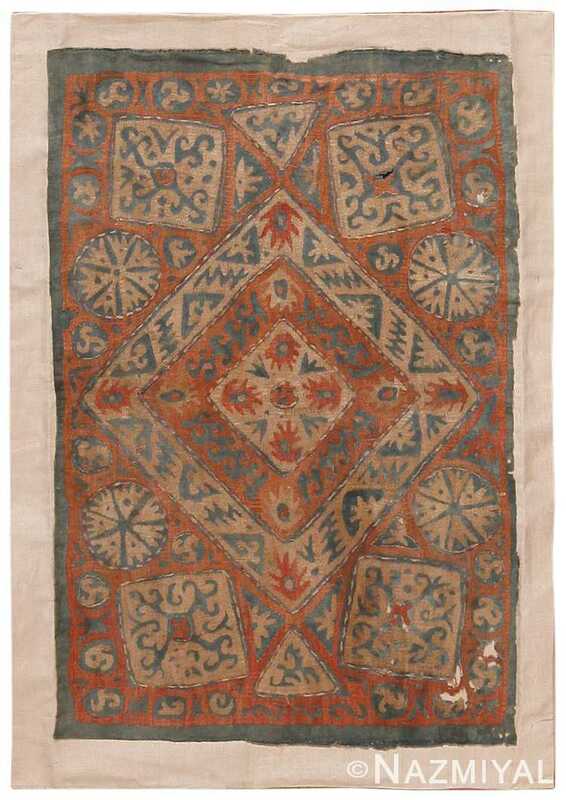 This antique textile uses silk thread that is couched onto a cotton ground. 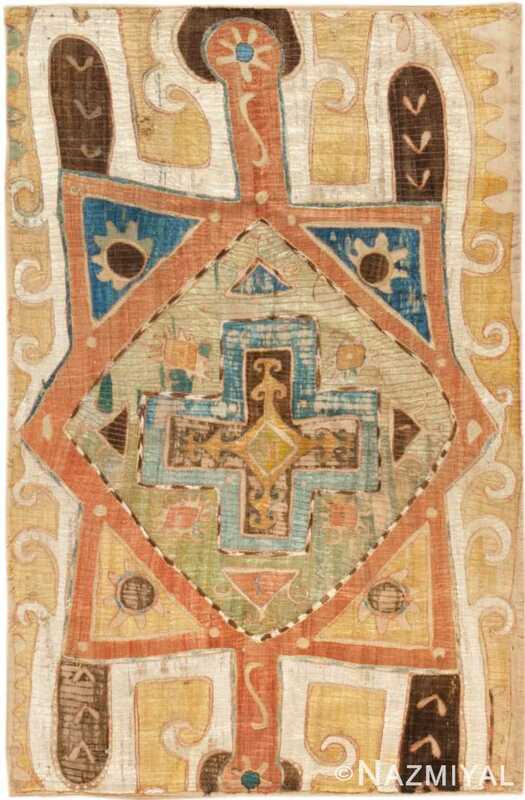 These works originate in the southeast corner of Russia / the Caucasus region, and are the artwork of tribal peoples with traditions going back thousands of years. 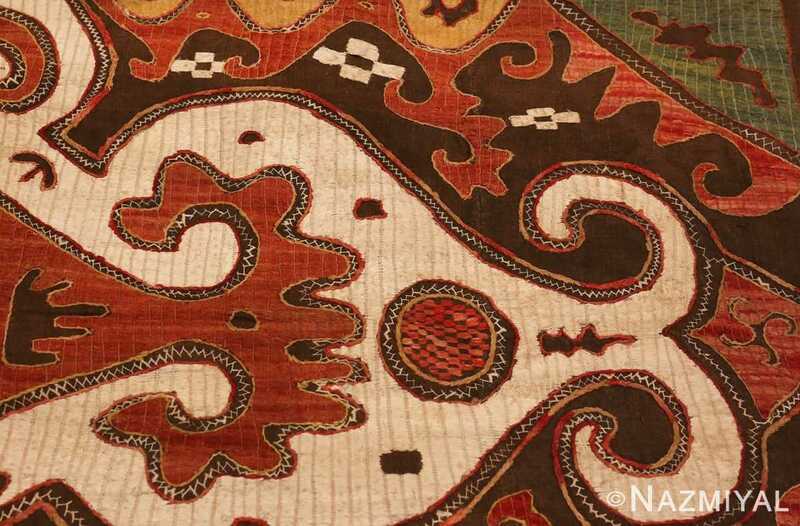 The design of this beautiful and tribal antique Daghestan is reflective of classical Safavid Persian art, yet the designs are often compared to contemporary mid century artists such as Pal Klee and Henri Matisse. 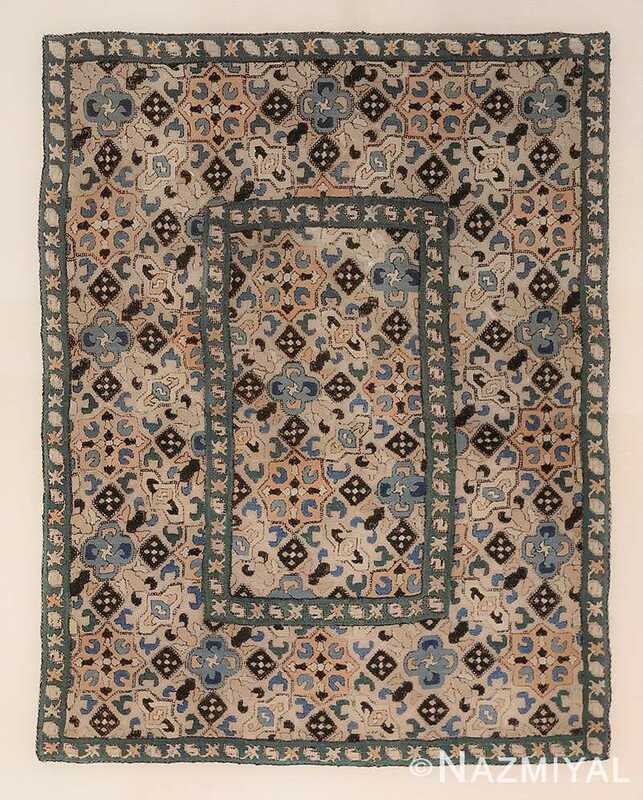 Most of the antique Kaitag embroidery textiles, from the Daghestan region, were woven for special occasions such as weddings, births and funerals. The beauty of the designs with their sweeping lines and geometric shapes allows them to remain a special piece that is to be revered and treasured. 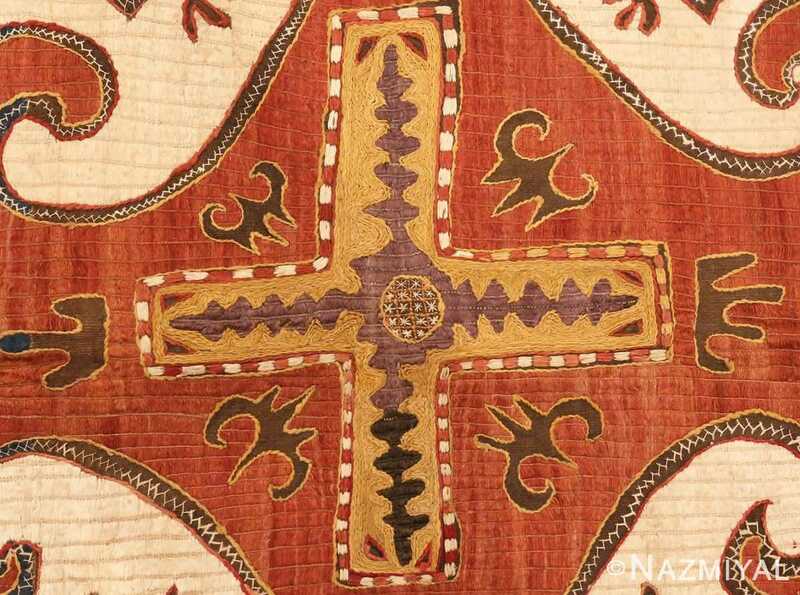 The design of this antique Caucasian Kaitag embroidery piece has a central focal point and is based on the concept of a central medallion. However, unlike many examples of Persian art, this piece is not surrounded by layers of thick borders. Instead the medallion extends to the edges of the work, which is bordered by only a simple brown edge. The antique Kaitag is symmetrical vertically and horizontally, but it is carried out in such a way that one can tell it was touched by human hands that carefully and meticulously executed the design. This fine example of historical artwork would add a touch of simplicity to any room design and stands as reflection of the traditions of the people who created it. It would make a beautiful addition to any collection, home or office.